In the 17th century, in one of history’s great migrations, an estimated 500,000 Armenians left their ancestral homes in the Caucasus for the deep interior of Persia. Most historical accounts recognize the move as a forced migration, part of Persian ruler Shah Abbas’ scorched earth policy and his subsequent relocation of ethnic populations to suit military and commercial needs. The Armenian crossing proved to be both long and tragic; encountering disease, famine, and inhospitable terrain, as many as half of the migrants died within the year of their upheaval. Yet those who survived managed to successfully establish one of Persia’s most culturally vibrant, even commercially successful village populations, building hundreds of new settlements from scratch, many of which would thrive well into the 20th century. 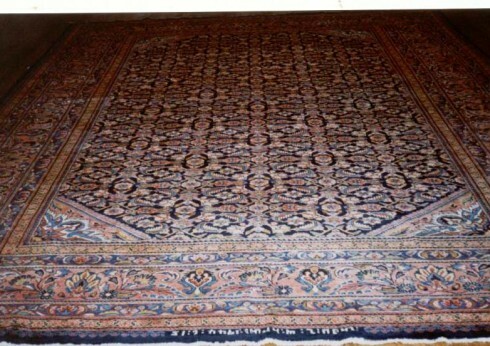 With access to tremendous stocks of wool, and carrying with them their long-held weaving tradition, the Armenians built a local economy on textiles, creating rugs not only for daily use, but for export to the burgeoning, highly enthusiastic American market. At the center of this rug-making economy was the small town of Lilihan, from which the area’s most famous carpets of the 18th and early 19th centuries take their name. It was the American market that truly invested in Lilihan, and in some sense dictated the aesthetic principals that would ultimately become the hallmark of the form. In their ornate design and plush construction, we see in these rugs the high Victorian sensibility of 19th century New York. Perhaps what stands out most is how incredibly thick and substantial they are, woven with fistfulls of pile in a style not only favored, but in a very real sense demanded, by the thriving the American market. In terms of design, too, the tastes of the American market held sway: Lilihan rugs make remarkably consistent use of classical Persian floral motifs, highly fashionable in New York’s drawing rooms and parlors. In this sense, Lilihan rugs are somewhat easier to spot visually than are other Iranian village rugs, so often woven in multitudes of tribal, classic, and even improvised motifs. In keeping with the Persian floral carpet tradition, most Lilihan rugs are woven in all-over curvilinear or lattice botanical patterns. And even more consistent than the pattern is the color: pink. The Lilihan region is famous for its natural-dyed rose weft, resulting in a naturally-burnished salmon field, beautifully contrasted with earthen shades of brown. The colors of these rugs are brilliant, and some models produced exclusively for the American market were even hand-painted in order to achieve hyper-bold pinks and blues. These painted versions unfortunately proved to be more delicate, and today have become quite rare to find on the market. Lilihans are, at their core, village rugs. They are somewhat coarsely woven using the Turkish, or double knot, and are known, as are many Iranian tribal and village textiles, for their extreme durability. 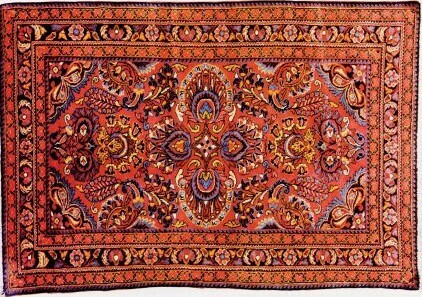 The rugs are single-wefted, constructed using what is known as the Hamadan weave, where each row of knots is separated by a single, thick shot of weft. Here, the wefts are rigid, while warps are sinuous. The result is a carpet in which visible warp threads are part of the elegantly rustic design. 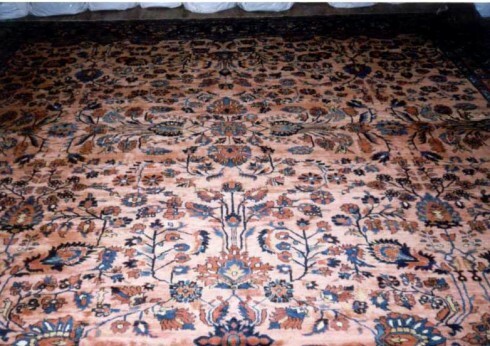 Today, Lilihan carpets remain in high demand in the American market. Cessation of production coincided with the mass emigration of Armenians back to their ancestral homes in present-day Armenia, when, in the mid 1940's, the Soviet Union opened the region to free immigration. As a result, the Armenian villages of Iran were slowly drained of their populations, and with them, their art.